Speculation was running high on Tuesday morning over whether Norway’s minority coalition government is about to fall. Dramatic and ongoing disagreement over next year’s state budget prompted Finance Minister Siv Jensen to call an extraordinary meeting of her own Progress Party’s national board, but there were no expectations the board would allow any more budget compromises. Newspaper VG reported that the emergency meeting was set for Tuesday afternoon. It followed another crisis meeting at the home of Prime Minister Erna Solberg Monday night, after Solberg cut short a trip to Northern Norway, to return to Oslo in another attempt to resolve the budget standoff. Solberg’s minority coalition, made up of her Conservative Party and Jensen’s Progress Party, has less than a week left before Parliament is due to discuss the budget. Neither Solberg nor Jensen has managed to secure majority support for their budget from their two small “cooperation parties,” the Liberals and Christian Democrats. The mood was somber and serious Monday night when those two party leaders left Solberg’s home. “Things are still extremely demanding,” said an otherwise tight-lipped Trine Skei Grande of the Liberals. Knut Arild Hareide of the Christian Democrats agreed. Grande has been unwilling to go along with Solberg’s and Jensen’s so-called bilpakken, a package of slight increases in fuel taxes to discourage driving but also changes in other vehicle taxes that offset them. Grande, who’s made a political point of demanding a much “greener” budget than what the government has proposed, wants much higher taxes on driving. Solberg and Jensen have claimed since first presenting their state budget proposal that the car tax package is not negotiable, but claim they’ve offered many other budget measures aimed at cutting carbon emissions. Norwegian Broadcasting (NRK) reported Tuesday morning that Jensen called in her party’s board “to inform them of the latest developments and situation around the budget.” The meeting comes just after newspaper Dagsavisen reported Tuesday morning that Jensen’s longtime predecessor as Progress Party leader, Carl I Hagen, was urging the party to either stand firm on the budget or leave the government. In a letter to all of the party’s Members of Parliament, Hagen claimed he and many other party veterans were “extremely worried” that government participation (which the Progress Party, Norway’s most conservative, won for the first time in 2013) had already forced so many compromises that its actual politics have been seriously watered down. The party’s standing in public opinion polls has indeed fallen, from the 16.3 percent of voter support it won in 2013 to single digits in some recent polls. Hagen, who was supposed to retire from politics but now seeks a national comeback in next year’s election, seems to believe the Progress Party is more vigorous and effective in opposition than in position. He urged the party to flatly refuse to be “steered” by the small centrist parties. There are other alternatives if Solberg finds herself forced to ask for a vote of confidence in Parliament. The Christian Democrats alone, for example, could end up supporting the budget as could other parties. Other opposition parties in Parliament may vote for the budget in return for other compromises, although that’s unlikely. 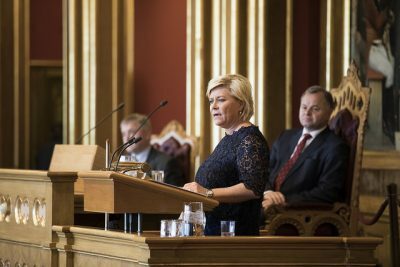 Solberg may even remain as prime minister at the mercy of support from parties on an issue-by-issue basis, or she and Jensen could strike a new support deal excluding the Liberals. One thing is clear: Time is running out for resolving what nearly all political commentators are now calling a full-blown state budget crisis. Grande, who also stands to end up as a winner or loser, told reporters that “the government has many things to think about.” And only five more days until finance debate over a budget is due to begin, on Monday December 5.